View of St Michael's church in St Albans, Hertfordshire. 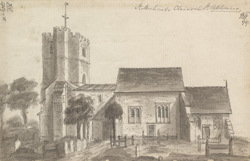 It is believed that in the 10th century Abbot Ulsinus of St Albans founded three churches in the area- St Michael's, St Peter's and St Stephen's. The churches were built for the use of pilgrims to the shrine of St Alban. St Michael's Church was built from the ruins of the Roman Verulamium and was built over this site. In the 12th century the church was extended to accomodate the increasing numbers of pilgrims. One of the church walls was decorated with a beautiful paintings of the Last Judgement. During the Reformation such images were considered idolatrous and it was painted over, it was not rediscovered uncovered until 1810.